Innerspring is the standard, and most common, mattress type and is likely what you think of when you imagine a mattress cross-section: a basis of springs (or coils) all tied together or individually wrapped. 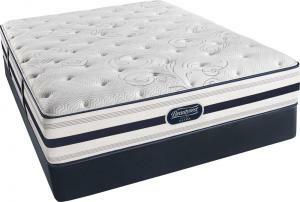 This base is then covered with foams and/or fibers to create a comfort level above the supportive springs. The foam on top comes in a variety of densities, allowing for either a firmer or softer mattress, and is an economical choice as well. 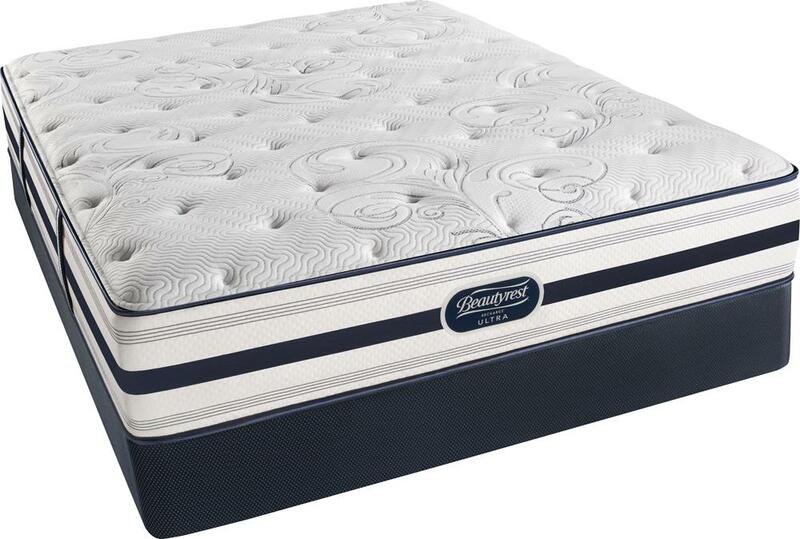 The Beautyrest Ultra Macgregor Park Pillowtop Luxury Firm Innerspring Mattress, for example, is both innerspring and a firm pillowtop choice, whereas the Beautyrest Black TATIANA Ultra Plush Pillow Top is softer and a plush. These mattresses have been around since the early 19th century and have remained a staple in the mattress industry, improving and changing with the shifting technologies. You can measure the quality of an innerspring mattress by the gauge and number of the coils: the lower gauge coils have less give, and the higher gauge coils, like a 14-guage, have more give. You don’t have to get picky, though, because you can just keep in mind that the more coils, the better the mattress can contour and support the sleeper. Especially when compared to their less breathable brethren, innerspring mattresses tend to be easier to move around on and stay cooler for the sleeper.  Ask us about Next Day Delivery! Height 13" 13" 13" 13" 13" 13"
Width 38" 38" 54" 60" 76" 72"
Length 75" 80" 75" 80" 80" 84"
The time to enhance your sleep is now. Ever since its inception of the first Pocketed Coil® nearly 100 years ago, industry leader Beautyrest has been designing groundbreaking solutions to give you a better night’s sleep. Today, the masterminds behind Beautyrest innovations have combined advanced technologies and research development to give you the perfect mattress so you can get the most out of every night’s sleep. Beautyrest’s state-of-the-art innovations includes the features you desire in a mattress. Advanced Pocketed Coil™ Technology that features a layer of 2,200 contouring nanocoils to provide refined support and spinal alignment and the new Micro Diamond™ Memory Foam creates conforming back support while preventing overheating similar to the SurfaceCool™ Plus Fiber. The brand new HD Performance Knit fabric cover to instantly wick moisture away from the sleep surface so you always remain comfortable. Your path to restorative sleep starts with a mattress customized to your specific sleep needs. Unfortunately, sometimes finding the right mattress to suit your unique needs can become a daunting task. Thankfully, Beautyrest takes the work out of mattress shopping. Choose your mattress type, level of firmness, and budget and Beautyrest will retrieve the perfect mattress for you. Then take your mattress comfort to the next level with advanced memory foam or the ultimate combination from the hybrid option. Beautyrest offers a large selection of mattresses from their three advanced mattress collections; Beautyrest Black®, Beautyrest Silver, and Beautyrest Platinum™. Enjoy the ultimate restorative sleep with Beautyrest Black®, which combines technology and luxury to take you to a new level of inspiring comfort. The elegant Beautyrest Silver™ collection applies sophisticated design with intuitive technologies to give you ultimate comfort and support at night so you can seize the next day. Experience more fulfilling, optimal sleep with the Beautyrest Platinum™ collection, which blends art and science to provide a refined sleep environment with assuring comfort. The SmartMotion™ Adjustable Base turns your bedroom into a sanctuary with customized elevation, advanced sleep position, and even a comforting massage all with the touch of a button. Finally, complete your sleep experience with the Beautyrest Complete collection with contouring pillows and advanced mattress and pillow covers featuring Aircool™ technology for renewed sleep. Choose from memory foam or non-memory foams at your perfect price point. Sign Up For Savings Today! Copyright © 2009 - 2019	Standard TV & Appliance All Rights Reserved.